You can only order a new gti now in 245hp so it's a decrease. That's a technicality. The entry level GTI is/was 227. Just because it's no longer available doesn't mean it didn't exist! Couldn’t agree more Fred. None of this will probably be true. Just a few. In the ago the usual ‘gti to receive a huge power boost’ stories were all the rage. That picture was doing the rounds a couple of weeks ago on various forums and the general consensus was that it wasn’t real. The one in this video though............. looks like it might be the genuine article; posted a couple of days ago on golfmk7.com. Apparently, the video was filmed of the mk8 Golf road testing in South Africa. Headlights in this car (seen at the end of the video clip) look very similar to the current Polo headlamps and not like the ones on the black car at the drive through. The slightly concave shape of the wheel arches is also similar to the Polo. The waist high crease line through the doors and into the rear quarter panel harks back to the mk6 Golf and is higher than on the current Golf. The bonnet line of the silver car in the video clip looks flatter and less rounded than the bonnet on the black car at the McDonald’s drive through. Door mirrors are attached to the door panels as evo1986 mentioned in an earlier post. 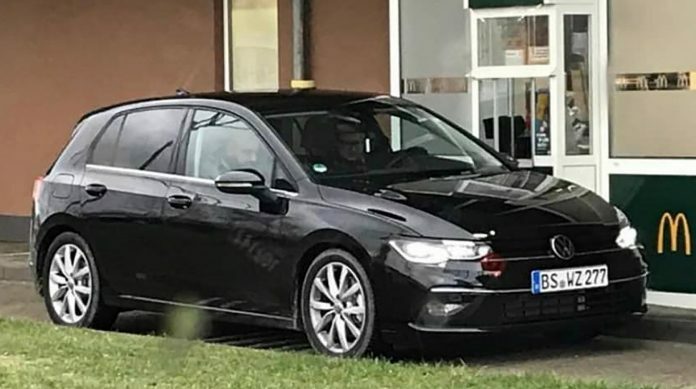 So, if it is genuine, quite similar but subtly different to the mk7/mk7.5, and not surprisingly it follows VW’s evolutionary design approach for the Golf. IMO VW weren’t ever going to produce a radically different design for their core model that might alienate existing and prospective owners. Seriously, are you for real? Those pics from the drive through look exactly like the potential finished car including mirrors on the door skins. And confirmed the guy above who's seen it who works for VW. I said the general consensus on other forums was that the black car wasn’t the real thing - merely conveying what others had said on other forums, so not my words. I didn’t say that the silver car was an actual mk8 either - I said in might be. If you look at the silver car in the video clip and compare it to the black car in the pictures, there are features that are common to both; door mirror positioning, waist line crease. It’s not unknown for manufacturers to still mask up light clusters on uncamoflaged vehicles in the final stages of testing to hide some of the finer details - the rear light clusters on current Polo were disguised with tape to look like the previous generation. We’ll just have to wait and see the launch pictures when VW officially reveal it in the metal.